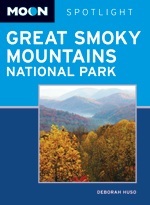 My new book, Moon Spotlight Great Smoky Mountains National Park (Avalon Travel, 2011), is now available for purchase. This 90-page compact guide covers the Newfound Gap Road, Cades Cove, Clingmans Dome, and Alum Cave Bluffs Trail. In addition, it offers my recommendations on sights, entertainment, shopping, recreations, food, and transportation. The book also includes maps with sightseeing highlights to help you plan your trip. If you’d like to order a copy, you can do so through the Avalon Travel website.